When CuCo won the Bournemouth Oceanarium creative pitch back in January, following our work for the Offshore Cafe, we promised that we would dive into details ASAP! A diverse array of the Oceanarium’s distinct and fascinating creatures burst from vibrant and colourful bubble clusters, giving the Oceanarium a brand new, fresh and exciting creative concept for 2014. Here the design can be seen on the Oceanarium’s main marketing tool – their DL and we are delighted to say that the concept will now be implemented across all online and offline Oceanarium marketing for the upcoming season. The Bournemouth Aquarium’s offering now includes the chance for visitors to get jaw-droppingly close to crocodiles at Croc Rock, as well as to learn about the adorable new baby loggerhead turtles as part of their European breeding programme. Visual and bright, the merging and separating bubbles create a sense of movement and excitement that will appeal to the whole family. Colourful, modern, and above all, fresh, CuCo are confident that the new creative will ensure the Oceanarium stands out from their competitors all year round. 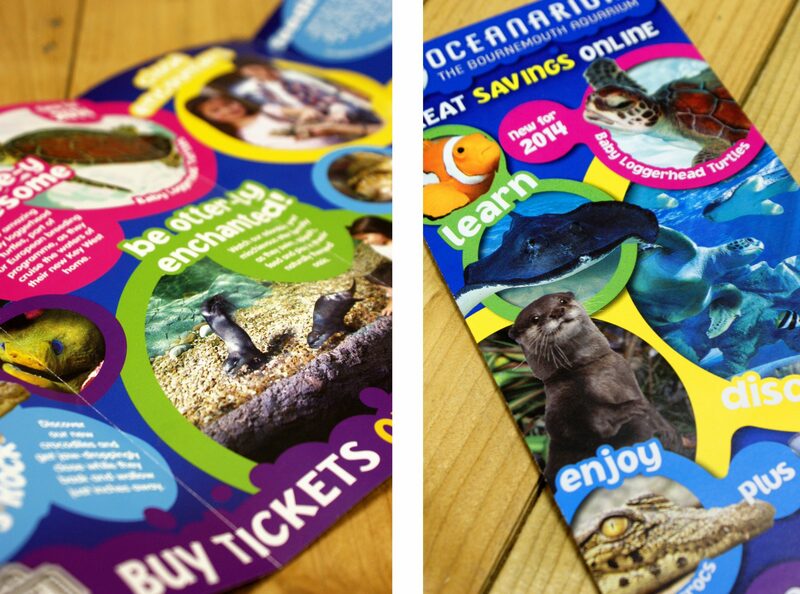 Keep a look out over the coming months as our creative concept is due to be implemented across a whole range of the Oceanarium’s marketing media, from press ads to bus wraps all across the South including Dorset, Hampshire, Somerset and beyond. Spot it? Send your photos to us at hello@cucocreative.co.uk ! Previous Post: Banner-tastic Bridport Arts! Next Post: What’s that coming over the hill…?